I've updated my Coming Soon page to reflect *all* books and novellas in the next--let's see--two and a half years. Excerpts pop up there as the books get closer. More could be added as I pitch more books/novellas. Last night at RWA, I won two Prism awards (for best paranormal romances) and came in second in a third category. 1. 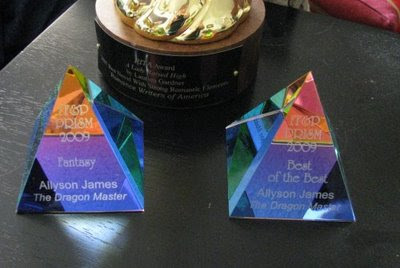 Dragon Master, by Allyson James, Best of the Best! 3. 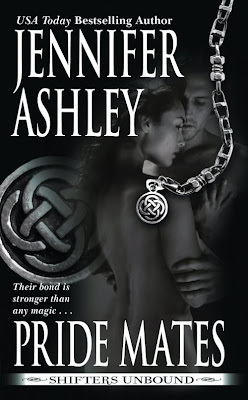 Immortals: The Redeeming, by Jennifer Ashley Second Place, Dark Para. Behold my pretty Prisms. Can you tell I'm proud?? The titles also are tentative (my contract says publisher has final say), but these are the working titles, and hopefully I'll get to keep them. Contracts have been signed, squees have been squeed, and we have liftoff.